Pigs swimming in the Bahamas. Pig Beach (also known as Pig Island, Major Cay, and officially Big Major Cay) is an uninhabited island (or cay) located in Exuma, the Bahamas. The island takes its unofficial name from the fact that it is populated by a colony of feral pigs that live on the island and in the surrounding shallows. 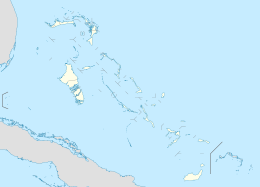 Exuma is a district of the Bahamas, and consists of over 360 islands. Near Big Major Cay is Staniel Cay. There are three freshwater springs on the island. The pigs are said to have been dropped off on Big Major Cay by a group of sailors who wanted to come back and cook them. The sailors, though, never returned; the pigs survived on excess food dumped from passing ships. One other legend has it that the pigs were survivors of a shipwreck and managed to swim to shore, while another claims that the pigs had escaped from a nearby islet. Others suggest that the pigs were part of a business scheme to attract tourists to the Bahamas. The pigs are now fed by locals and tourists and the island is unofficially known as Pig Beach by the locals. Big Major Cay is an uninhabited island. The island is home to approximately 20 pigs and piglets. A few stray cats and goats can be found on the island too. ^ Ripley's Believe It or Not! Annual 2013. ISBN 978-1-60991-032-7. ^ a b "Beach Babe: The happy pigs that love to swim in the Caribbean (and we're not telling porkies)". Daily Mail. January 25, 2011. Retrieved February 28, 2013. ^ The Bahamas - Guidebook Chapter: Chapter from Caribbean Islands travel guide book (6 ed.). Lonely Planet. 2012. ISBN 9781743210826. ^ "Swimming with Pigs". The Island of the Bahamas. Retrieved February 28, 2013. ^ "Exuma". The Official Website of the Government of the Bahamas. Retrieved February 27, 2013. ^ a b Susannah Cahalan (January 30, 2011). "Pig Kahuna is 'bacon' on own island". New York Post. Retrieved March 1, 2013. ^ "Lucky swines have own island". The Sun. January 24, 2011. Retrieved March 1, 2013. ^ a b Greaves-Gabbadon, Sarah. "Best Bahamas Trips: Swim with Pigs in the Exumas". Caribbean Travel Magazine. Retrieved February 28, 2013. ^ "Pigs swim in sea in Bahamas". The Telegraph. July 16, 2009. Retrieved February 27, 2013. ^ "Swimming Pigs of Big Major Cay". Atlas Obscura. Retrieved February 27, 2013. ^ Frommer's ShortCuts (2012). The Exumas, Bahamas: Frommer's ShortCuts (2 ed.). John Wiley & Sons. ISBN 9781118470343. ^ McRae, Mavis (May 23, 2012). "The Bahamas' Wild Pigs Meet Dr. Sylvia Earle And Mission Blue (PHOTOS)". Huffington Post. Retrieved February 28, 2013. This Bahamas-related article is a stub. You can help Wikipedia by expanding it. This page was last edited on 19 November 2018, at 20:14 (UTC).